The Catholic Church is the longest-standing and the most universal of all institutions. The contributions made by Catholic men and women over the past 2000 years are most impressive, from a properly functioning calendar to the inventions of many things taken for granted today. 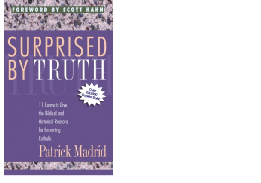 This book walks readers through the most amazing achievements of Christ's Body on earth. From economic and mercantile developments to scientific and astronomical advances, from the cataloging of zoological and botanical species to the cherishing of beautiful music and fine arts, Fr. Meconi shows you why the Catholic Church stands as the greatest promoter of human culture and knowledge. C.S. Lewis and Emily Dickinson to Lily Munster and the Great Pumpkin to reveal the historical, hilarious, and even holy origins of the words we use, even though many of us have forgotten what they mean. 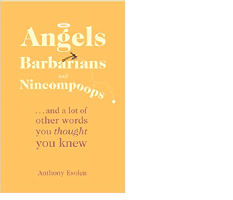 Join Professor Esolen on this fun yet educational romp through 98 of your soon to be favorite words. 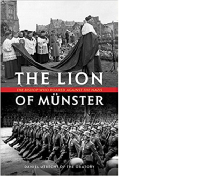 This beautifully illustrated volume will be treasured by long-time devotees of our Blessed Mother under the title of Our Lady of Fatima, as well as those, both Catholic and non-Catholic alike, who seek to learn more about the dramatic events related to the apparition that have unfolded over the course of the last century. Jean M. Heimann traces the history of the apparitions at Cova da Iria and, assisted by over fifty full-colour illustrations, guides the reader through the hundred years since the Mother of God appeared to three little children in a small town in Portugal. God’s love and an understanding of the meaning of suffering and what to do with it that belied their years. And their teaching was not limited to their immediate family: Everyone with whom they came into contact, from doctors and nurses, to major political figures and popes to family friends and other children, was profoundly affected by the encounter. This enthralling chronicle of Mary s intercession makes clear that Christ’s mother is indeed the most powerful woman in the world, and the answer for how we can save the world and bring us back into her Son’s heart. Not only is she keenly interested in assisting Christians, she has the ability to do so, even in the face of the gravest odds. We just have to ask. Father Anthony J. Paone S.J. A series of short, daily reflections on the spiritual life. Written with loving care by Father Anthony Paone, this devotional will strengthen your love for Christ and his teachings. In this devotional treasure, you ll find forty daily reflections on the passion and death of Our Lord. Each day’s reflection suitable for Lent or for any time of the year includes a scriptural text, a meditation, a brief prayer, and an excerpt from the visions of two celebrated Catholic mystics: Blessed Anne Catherine Emmerich (1774 1824) and Venerable Maria de Agreda (1602 1665). 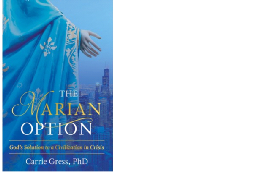 Filmed in multiple locations and Marian shrines, Queen of Heaven explains Mary’s role in God’s plan, from before the beginning of time until today. 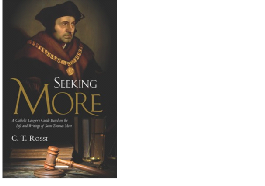 Seeking More is a guide designed to help you discover the Church’s perennial teachings on the nature and purpose of law, the balance required in Church and State relations, and the duty of all Christians to work for the common good. However, like any good lawyer, author C.T. Rossi goes further than merely providing those teachings in the abstract and applies the rules to the facts through an in-depth study of the life of St. Thomas More.